When you think of catnip (Nepeta cataria), you may picture a kitty rolling around in a blissful, abnormal state. But this plant is so much more than a cat’s version of cannabis – it’s a powerful healer for humans too. And because it’s part of the Lamiaceae (mint) family, it’s exceptionally easy to grow! Also known as catswort, catmint, and sometimes called catnep, catnip is native to Europe and parts of Asia, but is now grown all over the globe. The plant looks similar to other mints, with bright green and coarse-toothed leaves. The flowers of the catnip plant tend to be white with pale purple or pink spots. Before the arrival of Chinese teas, Europeans often used catnip to make their favorite decoctions. Historically, it wasn’t only cats who got a sort of buzz from the plant, it was documented that people too experienced interesting moods when eating catnip. In one story, it is said that an executioner self-medicated with the herb in order to give himself the courage needed to carry out his daily hangings. The healing properties of the plant have long been recognized as well—being used as everything from a sedative for children to seemingly contradictory use as a energy-enhancing herb for adults. Though there are varying accounts of how catnip can be used to influence moods, it’s largely recognized as more of a relaxant than a stimulant. Catnip tea is said to help reduce stress and promote sleep. The essential oil of catnip includes something called nepetalactone, which is credited with many of its benefits. The plant is said to offer anti-inflammatory, antispasmodic, antimicrobial and antiviral benefits. Some of the most prominent research on catnip is related to its use as an insect repellant. Cockroaches, mosquitoes, and flies are said to be repelled by nepetalactone, present in its oils. Iowa State University researchers found it to be 10 times more effective at repelling mosquitos than DEET (commonly used in traditional bug sprays). It was 100 times more effective at repelling cockroaches There is similar evidence that it can effectively kill flies. Additionally, the plant could also be used as a natural preservative agent due to harnessing antimicrobial properties. Like other mints, such as peppermint, catnip is fairly easy to grow. But, also like other mints, it will grow and grow and grow, taking over the area if allowed. For this reason, it might be best to use a pot for planting your catnip. You can start growing it from seed indoors in the springtime, moving it outside when temperatures get warm. Alternately, you can keep it indoors for year-round growing as long as you have a window that gets six good hours of sunlight each day. Outside, they like a lot of light, so keep that in mind when deciding where to place them. To ensure optimal growth and overall health of the plant, keep it evenly moist throughout the summer. 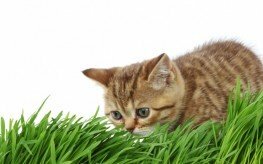 Not surprisingly, neighborhood cats may be drawn to the catnip, so cover it if you don’t want them rubbing on it, rolling in it, or chewing on it. However, if you don’t mind a sort-of feline lounge environment, grow some just for the kitties. Trim back the flowers to encourage a full, healthy plant with lots of new growth. Harvest catnip as needed, trimming a stem down to the base or right above a leaf joint to facilitate more growth. The leaves can be used fresh or dried, though air-drying is the best method if you want to preserve your catnip. A tea is the most common way to get the benefits of catnip. Use 1 to 2 tsp. 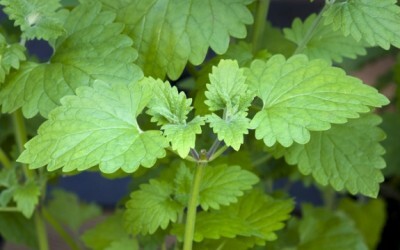 of dried catnip leaves (more if using fresh) per cup of boiled water. Allow to steep for 10 minutes before enjoying.